Clean and dress to perfection! Give your wheels and tires the concours treatment with the Speed Master – Pinnacle Wheel Combo! Brake dust and grime cling all over the wheel surface, not just the visible wheel face. The Speed Master Wheel Brush reaches between spokes to clean even the backside of the wheel. 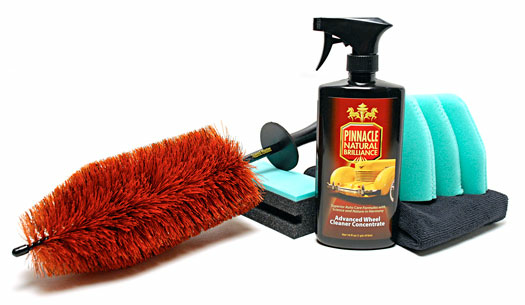 Pinnacle Advanced Wheel Cleaner Concentrate releases grime for easier removal. The Speed Master - Pinnacle Wheel Combo is the last word on clean wheels. The Speed Master Wheel Brush and Pinnacle Advanced Wheel Cleaner Concentrate are the perfect pairing for all types of wheels. Pinnacle’s water-based, non-acidic cleaner begins lifting brake dust on contact. Gentle agitation with your Speed Master Wheel Brush will leave your wheels spotless and brake dust-free. Get both products at an exceptional savings in the Speed Master - Pinnacle Wheel Combo! This pair of products is already popular among Corvette owners because they depend on safe, gentle cleaning for their aluminum and chrome spoke wheels. We’re bringing their detailing secret to everyone with the Speed Master - Pinnacle Wheel Combo! Speed Master Wheel Auto Brush This advanced wheel brush has everything you want in a quality detail brush and much more. The Speed Master Wheel Brush has a thicker, reinforced stem. It maintains its flexibility but the new stem is more rugged for frequent use on auto wheels. The bristles are slightly feathered on the ends to gently clean delicate wheel finishes, such as coated or plated wheels, without scratching. In addition, the patented memory bristles regain their shape after each use. Just rinse them in hot water and hang the brush to dry. The soft Nylex bristles will not scratch any wheel, and they’re chemical resistant. The Speed Master Wheel Brush fits into spaces ½ inch wide and the stem bends to clean around spokes. The brush stem and tip are covered in vinyl to protect the wheel from scratching. No wheel design is too intricate for the Speed Master Wheel Brush! Pinnacle Advanced Wheel Cleaner Concentrate Pinnacle Advanced Wheel Cleaner Concentrate is a concentrated wheel cleaner that is designed to annihilate pesky brake-dust and oily road grime. Formulated using the latest cleaning technology, Pinnacle Advanced Wheel Cleaner Concentrate forgoes caustic acids, butyl ethers, and other harsh detergents that do more harm than good. Pinnacle Advanced Wheel Cleaner Concentrate changes colors as it dissolves brake dust and the concentrated formula can be diluted up to 1:3 with water for maintenance cleaning. Flex Foam Tire Applicator The Flex Foam Tire Dressing Applicator is made of a unique foam composition that conforms to the curve of your tires’ sidewalls. Foam applicators that are precut into a curve might not match the curvature of your vehicle’s particular tires. The Flex Foam Tire Dressing Applicator flexes to hug the rubber and apply a neat, even layer of tire dressing. After your wheels are cleaned and dry, use a Flex Foam Tire Applicator to apply a neat layer of your favorite dressing, such as Pinnacle Black Onyx Tire Gel. 3 Flex Foam Finger Pockets Flex Foam Finger Pockets are the easiest way to clean or polish tight places. These foam pockets fit over three or four fingers so you can maneuver in small spots more easily. The soft foam is perfect for cleaning brake dust out of lug nut holes. Finger Pockets allow you to reach between the slats in your vehicle’s grill or between spokes. Microfiber All Purpose & Wheel Detailing Towel Buff your wheels, paint, glass, chrome, and interior surfaces to a brilliant shine with the Microfiber All Purpose & Wheel Detailing Towel! It's paintwork-safe and the black color makes it the ideal towel for cleaning, polishing, and drying wheels. This weekend, instead of scrubbing your wheels with a harsh brush and corrosive cleaner, give them a gentle cleaning with the Speed Master - Pinnacle Wheel Combo. The soft bristles of the Speed Master Wheel Brush and the gentle cleaning power of Pinnacle Advanced Wheel Cleaner Concentrate will give you concours quality results on all wheels. A total retail value of $83.96, you save $33.97! Speed Master Bottle Rack Coming Soon!